Stainless steel dinner fork. Handle has a bead border. Dishwasher safe. Imported. 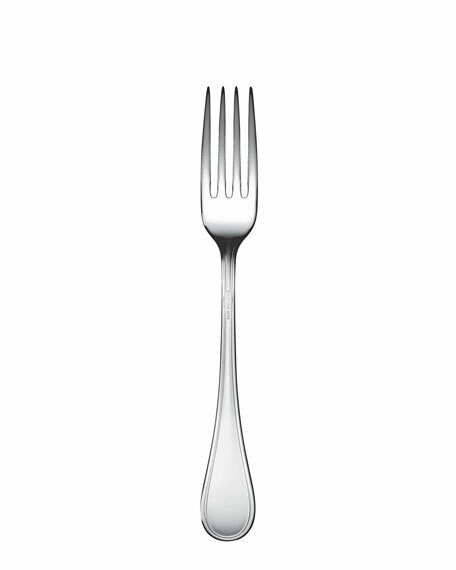 Optimum-weight stainless steel dinner fork. Approx. 8.5"L. Bright satin finish is hand rubbed to a warm luster. Decorative motif on front and back. Dishwasher safe. Avoid cleaners that may contain citrus. 19/10 stainless steel dinner fork. 24-kt. gold accents. Dishwasher safe; hand washing recommended. Imported.